HMS Ark Royal, the “Mighty Ark”, in her day the most famous ship in the Royal Navy. “The Might Ark”, the most famous ship of the Navy in the 1970 s.
Painted partly as “a tribute to the great artist JMW Turner” who loved to visit Plymouth, Devon and paint the fleet and people. Turner helped me with my “A Level Art history” a story for another time, here a tribute, HMS Ark Royal towed to her last berth to be broken up. This atmospheric painting lay in a folder for 25 years, forgotten, undiscovered. 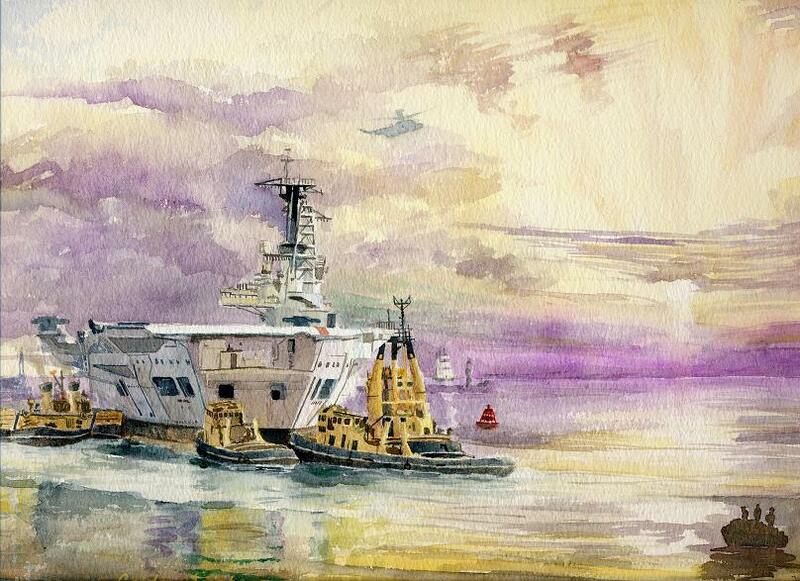 Ark Royal I saw her departing Plymouth Sound for the last time, a result was this water colour painting. An illustrious name, the first ‘Ark Royal‘ started life as the ‘Ark’ built at Deptford, London, on the River Thames, for Sir Walter Raleigh. Following the convention at that time the ship soon bore the name of her owner so became Ark Raleigh. She was purchased for Queen Elizabeth I, for the sum of £5,000. Her first action was in 1588 against the Spanish Armada, when Ark Royal, as one of the largest vessels in the English fleet was the flagship of Lord High Admiral Howard. Our Ark Royal shown here was Britain’s last strike carrier, she became a household name through the filming on board of the BBC TV series “Sailor” with “Sailing”, it’s signature song by Rod Stewart.